Some days back we had a Webex session with a provider at work, we asked them to record the session so they can then send us the MP4 file for easy distribution of the demo across our company. “Yes, sure” – they said. Unfortunately that “Yes, sure” transformed again into a nightmare and a waste of time. Who to blame? Cisco Webex. 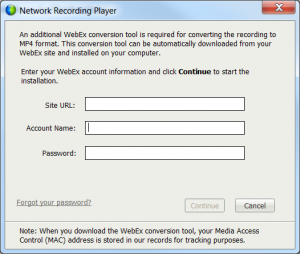 For some reason converting an ARF file to MP4 cannot be done on the Cisco Webex player without first entering a Webex URL and authenticating with user and password. I opened a free Webex account but this doesnt seem to help either as the “validating” icon never stopped. I tried to search for converting tools online but couldn’t find any. The only workaround I was able to find and it also involves a terrific amount of wasted time is to first convert the file as a WMV (which for some reason seems to be done online and not on your own computer, even if you have the recorded ARF locally) it took more than 80! 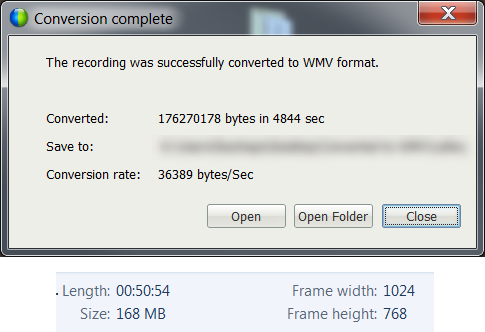 minutes for a 50 minutes Webex recorded session to be converted to WMV. If you need to also convert the WMV you can use any standard format converter like for example Movavi Video Converter which I happened to purchase. Are you a Mac user? I am sorry, you dont seem to even have the option to convert to MP4, I know right? For a reason beyond my understanding, Cisco makes it really a nightmare to export to MP4 (which plays well with out Google environment), its time that these guys that claim to be “Nr.1” pay a little bit more attention to this aspect of their service. Next time, I will push for using another tool! I wish Google Hangouts would have an easy feature to record online sessions. Thanks for this article. I can really confirm this. Mac users don’t even have the option. This is very annoying. Moreover, Cisco’s support doesn’t seem to care either. Using proprietary formats without having easy possibilities to convert is not up to date either, in my opinion.